Shimano sprocket 9-sp. 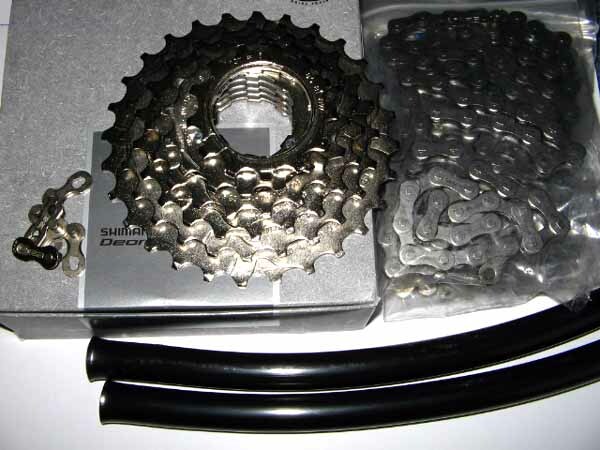 11-34t., 3pcs chain for 9-speed incl. 6pcs power-link, plus 2pcs. chain tubing. Suspension Fork 1 1/8" Toxy "lite-w8"
Lightweight 20 Inch Suspension Fork (Spring/Elastomer), adjustable, with disk break mount; thread 1 inch, 200mm (to be cut shorter), travel 50mm, maintenance-free. 1580gr. Toxy "lite-w8" Suspension Fork (1580gr.) with alloy stanchions; adjustable preload system, travel 50mm. V- & D.B.-option. Available for Toxy-CL, LT & TT. 250g less. Basic model Toxy-CR, alloy full suspension frame (Shimano Deore 9sp. ), including side kick stand & alloy pedals.